Put yourself back in the opulent baroque era with our Baroque Countess Costume! The noble dress is perfect as a disguise for noble ladies as well as vampire ladies and turns you on the upcoming Halloween celebrations and historical motto parts under guarantee to the absolute eye-catcher! The Baroque Countess costume consists of a dress and a bolster. Waisted cut and styled with a corsage, the Baroness dress immediately recalls the vestments of noble ladies from the Baroque period. Wide, lace-trumpet sleeves and black-purple trim give the historic disguise an elegant look. Floral patterns decorate your Halloween costume in addition. 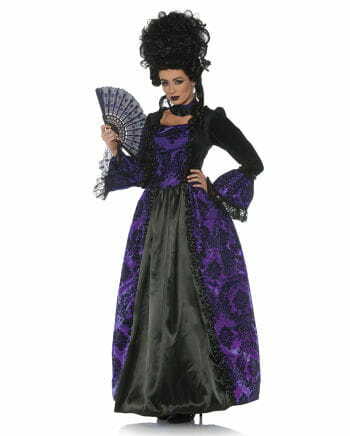 The baroque Countess costume is rounded off by a black and purple bolster band as well. The article is an adult costume and not a toy. Not suitable for children under 3 years. May contain small parts that can be swallowed - suffocation. Keep away from fire and open flames.